A quintessential pirate's nautical map. Ocean Atlantique ou Mer du Nord. 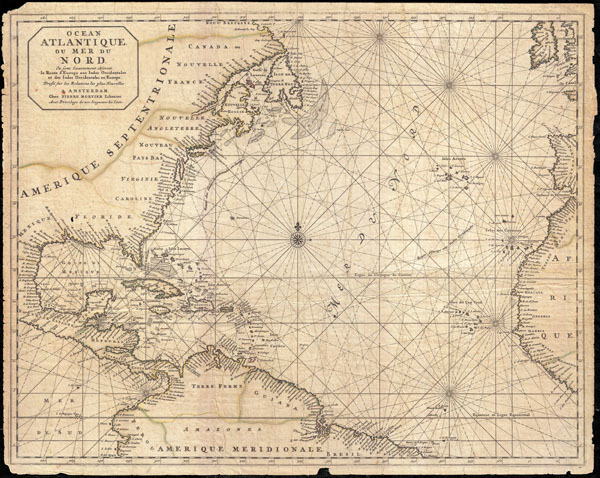 This is a rare and remarkable 1693 nautical chart of the Atlantic Ocean by Pierre Mortier. Covers the North Atlantic from rough 5 degree south latitude to roughly 56 degrees north latitude. Includes much of North America, all of the West Indies and Caribbean, Central America, the northern parts of South America, Western Africa, Ireland, and parts of Western Spain. As a whole Mortier's map presents a moderately accurate picture of the Americas. The coast lines, particularly in North America are a unnaturally craggy. Florida takes on an inverted cone aspect. The barrier islands and capes off the coast of Virginia and Carolina are noted, but inaccurately represented. The Chesapeake Bay is slightly diminished in size. The entrance to the Mississippi River is either not apparent or confused with the conjectural 'Rio de Spirito Sancto.' This river, most likely associated with early entradas into Mobile Bay, was confused with the Mississippi on numerous older maps. Politically, Mortier recognizes the French claims to Canada, the British claims to the region between New York and the St. Lawrence, Dutch claims to New Jersey, Pennsylvania, and Baltimore, and Spanish Claims to Florida. Identifies New York, Baltimore, Philadelphia, Staten Island, Long Island, Cape Hatteras, Cape Look (Cape Lookout), Port Royal, St Augustine and Havana, among others. Like most maritime charts this map has very little inland detail but a high level of nautical detail. Identifies thousands of coastal destinations throughout as well as offshore shoals, reefs, and other undersea dangers. Mortier additionally maps various shipping routes between Europe and the Americas. This chart was composted by Pierre Mortier for issue in his extraordinary 1693 nautical atlas, Le Neptune François. As a side note, this map, with its moderate age toning, distinctive rhumb lines, and tattered margins, looks exactly like the quintessential pirate's map - which given its issue at the height of the Great Age of Caribbean Piracy, it may well have been. Pierre Mortier (1661 - 1711) or Pieter Mortier was a cartographer, engraver, and print seller active in Amsterdam during the later 17th and early 18th centuries. Mortier, then known as Pieter, was born in Leiden. He relocated to Paris from 1681 to 1685, adopting the French name Pierre, which he retained throughout his career. There is developed deep French connections by bringing sophisticated Dutch printing technology and experience to nascent French map publishers such as De L'Isle, Sanson, Jaillot, de Fer and De Wit. Consequently, much of Mortier's business was built upon issuing embellished high quality editions of contemporary French maps. In the greater context of global cartography, this was a significant advantage as most Dutch map publishes had, at this point, fallen into the miasma of reprinting their own outdated works. By contrast, the cartographers of France were producing the most accurate and up to date charts anywhere. Mortier's cartographic work culminated in the magnificent nautical atlas, Le Neptune Francois. H was awarded the Privilege, an early form of copyright, in 1690. Upon Pierre's death in 1711 this business was inherited by his widow. In 1721, his son Cornelius Mortier took over the day to day operation of the firm. Cornelius partnered with his brother-in-law Jean Covens to form one of history's great cartographic partnerships - Covens and Mortier - which continued to publish maps and atlases until about 1866. Mortier, P., Le Neptune françois, ou Atlas nouveau des cartes marines...,1693. Average. Overall toning. Some minor verso reinforcement. Margins ragged. Original platemark visible. Koeman, C., Atlantes Neerlandici, IV, 430. Brown University, John Carter Brown Library, Z N442 1693. New York Public Library, Map Division, 97-6339 [LHS 424A].